Tina Fey pulls out all the stops to embarrass the new players this season. Photo from The Silhouette. It’s an iconic phrase we all know, unless of course you live under a rock or actually have something cool to do on Saturday nights. “Saturday Night Live” is one season away from hitting the big 4-0, but by the looks of this season’s premiere, we’re hoping they’ll make it that far. We experienced a pretty bad breakup with a couple of the show’s key players last season. Bill Hader, Fred Armisen and Jason Sudeikis basically stood us up. Real cool guys, you didn’t even have the decency to call. With them gone, we’re left with Taran Killam (yes, from “Stuck in the Suburbs”), Kenan Thompson (who looks identical to his “Good Burger” days) and Bobby Moynihan as this season’s head honchos. We have faith in their abilities to carry the torch, but we’re still wary about some of the new additions. Stefon’s reaction to the new member dance… Yikes! Photo from Collider. The show brought on six fresh faces, including Beck Bennett (who can go back to his classic AT&T commercials if all else fails), John Milhiser, Kyle Mooney (who gives off a Fred Armisen vibe), Mike O’Brien, Brooks Wheelan (who wasn’t afraid to rock his birthday suit in his debut sketch for a cheap laugh) and Noel Wells. Yep, only one girl. Way to be sexist, NBC. Cough cough. Since most veteran members aren’t returning this season, that means their memorable characters will no longer be on the show. 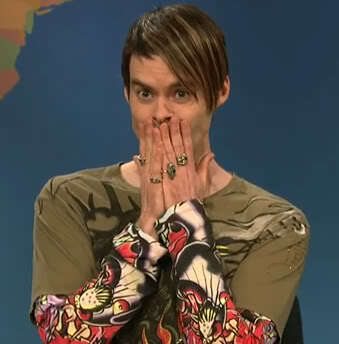 Who will give us sketchy club suggestions like Stefon (Bill Hader)? Or make us laugh quite like the always unprepared singing duo, Garth and Kat (Fred Armisen and Kristen Wiig)? Sadly, no one could come close to doing these iconic characters justice, so it’s time to see what the new members can bring to the table. A more recent character that never seems to disappoint is Drunk Uncle (Bobby Moynihan), returning for his 6th season. He was on top of his game during Weekend Update with some classic blubbering “back in my day” quotes — “You went to school ’til you were eight, and then you got married to a factory” — along with some classic drunken facial expressions. Speaking of Weekend Update, we’re keeping an eye on Kyle Mooney due to his impressive skit as a cheesy stand up comedian. He seemed more confident then Cecily Strong, who will be taking over for fan-favorite Seth Meyers this season. She’ll get better with time, fingers-crossed! She definitely caught our attention last season with her character, “Girl You Wish You Hadn’t Started a Conversation With at a Party,” so we’ll be sad to see that ditzy girl go. Are you excited for Miley to host tomorrow night? Do you think the New Era upon us will be a hit or miss? Let us know in the comments, and don’t forget to tweet at us @SpeakeasyMag!